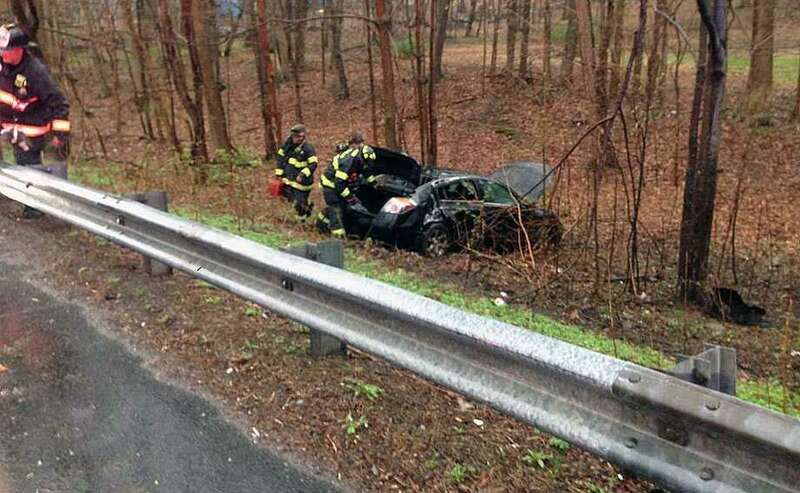 A crash in Fairfield, Conn., on April 20, 2019. The 1948 mural is being restored for an expected June showing. Stop and Shop stores in Fairfield have seen a considerable decrease in consumer traffic since the strike began April 11. Stop & Shop workers strike at the Villa Avenue location in Fairfield. Fairfield resident Nancy Lefkowitz spoke out against gun violence at a "Let's Talk About Guns" event on Feb. 22 in the Greenfield Hill Congregational Church. A Fairfield Democrats Facebook post announced a May 8 campaign kickoff for First Selectman Mike Tetreau, who is seeking a third term, and Nancy Lefkowitz, who is seeking a Selectman seat. State Rep. Brenda Kupchick (R-132) announced Feb. 24, 2019 that she will run for the office of First Selectman in the November election, opposing incumbent First Selectman Michael Tetreau. In the eat-in section of the kitchen there is an exposed brick wall. Across the street from this house is the H. Smith Richardson Golf Course. The gray colonial contemporary house at 104 Morehouse Road sits on a property of nearly one acre across the street from the 18-hole H. Smith Richardson Golf Course. The large raised wood deck is an ideal entertainment venue. The backyard also has a shed. The sizable formal living room features wall-to-wall carpeting and tall windows looking over the large backyard. The eat-in kitchen features a set of sliding doors to the large wood deck, granite counters, a vaulted ceiling with exposed beams, and skylights. This house is in a private location in lower Easton. In the family room there is a floor-to-ceiling red brick fireplace and two large picture windows. The front door opens into the two-story foyer of this house, which has a layout that easily flows from one room to the next. The good-sized formal dining room has wall-to-wall carpeting and is accessible from the kitchen and the foyer. This 2,528-square-foot house sits on a 0.94-acre level property. Fairfield Ludlowe's Kylee Holderied (12) pitches during softball action against Fairfield Warde in Fairfield, Conn., on Friday May 11, 2018. Ludlowe received The Walker Softball Championship Cup after beating Warde 5-4. Ludlowe softball players and sisters Kylee, top, and Luka Holderied. Fairfield Ludlowe's Kylee Holderied (12) pitches against St. Joseph during FCIAC softball semi-final action at Sacred Heart University in Fairfield, Conn., on Thursday May 24, 2018. Inside the pool house there are living and dining areas, a kitchenette and a full bath. In the backyard of the main house there are two flagstone patios and a third patio by the pool house. The sizable breakfast room has two pass-through areas to granite counters in the family room, ideal for entertaining. The formal dining room features a marble fireplace and wainscoting on the lower walls. The 2.14-acre level property contains a heated in-ground swimming pool and sizable pool house, which features an entrance ramp. The time is right to move into the gray colonial house at 200 Eleven O’Clock Road in Greenfield Hill. The gourmet kitchen features a center island/breakfast bar, granite counters, built-in desk area, skylight, high-end appliances, and sliding doors to the backyard. The generously sized family room has a stone fireplace, vaulted ceiling, a bar area, and two sets of doors to the backyard and patio. The master bedroom suite has a walk-in closet, two additional closets with mirrored French doors, and an updated marble bath. The formal living room has the first of the home’s three fireplaces. Steve and Lauren Field with their son Aaron and daughter Lucy. Sen. Chris Murphy, right, attends a discussion on gun culture in America at the Fairfield Quick Center April 15, 2019. Mary Himes, right, and others at the Fairfield Quick Center for a discussion on gun culture in America. Westport Police Chief Foti Koskinas at the Fairfield Quick Center on April 15, 2019. The hunt is on at the Easter Eggstravaganza 2019 at the South Pine Creek Complex, Saturday, April 13, 2019, in Fairfield, Conn.
Kristen Dance of Fairfield and her daughter Hadley, 2, enjoy the day at the Easter Eggstravaganza 2019 at the South Pine Creek Complex, Saturday, April 13, 2019, in Fairfield, Conn.
Will McStay, 3, of Norwalk, and his mom, Caitlyn, check out the prizes in the eggs at the Easter Eggstravaganza 2019 at the South Pine Creek Complex, Saturday, April 13, 2019, in Fairfield, Conn.
Liam Huisking, 20 months, of Fairfield, and his aunt, Beth Huisking, get in the spirit at the Easter Eggstravaganza 2019 at the South Pine Creek Complex, Saturday, April 13, 2019, in Fairfield, Conn. Kids get ready to start grabbing eggs at the Easter Eggstravaganza 2019 at the South Pine Creek Complex, Saturday, April 13, 2019, in Fairfield, Conn.
Antonio Ramos, 9, of Fairfield, and his sister Carly, 6, get in position to egg hunt at the Easter Eggstravaganza 2019 at the South Pine Creek Complex, Saturday, April 13, 2019, in Fairfield, Conn.
Acting like eggheads from, from left, Emma Perkins, 8, twins Charlotte and Elizabeth Ettl, 8, and Aubrey Perkins, 3, all of Fairfield, at the Easter Eggstravaganza 2019 at the South Pine Creek Complex, Saturday, April 13, 2019, in Fairfield, Conn.
Vicki Stoddard, 5, of Darien, waits for the startling whistle to blow at the Easter Eggstravaganza 2019 at the South Pine Creek Complex, Saturday, April 13, 2019, in Fairfield, Conn.
Lucas Villafane, 4, of Fairfield, poses for a picture with his aunt, Dolli Moncrief, and the Easter Bunny at the Easter Eggstravaganza 2019 at the South Pine Creek Complex, Saturday, April 13, 2019, in Fairfield, Conn. Egg collecting was at a fast pace at the Easter Eggstravaganza 2019 at the South Pine Creek Complex, Saturday, April 13, 2019, in Fairfield, Conn. The public enjoyed seeing the renovated Sherman Parsonage at 480 Old Post Road at an open house on Thursday, April 11, 2019, in Fairfield, Conn.
Real estate developer John Paul shows off the new interior of the Sherman Parsonage at 480 Old Post Road at an open house on Thursday, April 11, 2019, in Fairfield, Conn. The renovated Sherman Parsonage at 480 Old Post Road at an open house on Thursday, April 11, 2019, in Fairfield, Conn.
Lakin Hughes Schostak of Fairfield, left, who grew up in the 200-year-old house, and her friend Sara McEldowney Jannott of Fairfield, relive history at the Sherman Parsonage at 480 Old Post Road at an open house on Thursday, April 11, 2019, in Fairfield, Conn.
Fairfield Ludlowe Drama Club cast members rehearse a scene from "Hello, Dolly!" Save the Children headquarters at 501 Kings Highway E. in Fairfield. The Fairfield Museum and History Center is restoring this mural of Black Rock Harbor.